With the advancement in the field of Robotics, human intervention is becoming less everyday and robots are used widely for purpose of safety. In our day to day life fire accidents are very common and sometime it becomes very difficult for fireman to save human life. In such case fire fighting robot comes in picture. This is a advance project for Electronics students interested in "Robotics", which uses RF technology for remote operation of this robot and uses 8051 microcontroller. Below picture shows the actual image of this fire fighting robotic vehicle. As you can see in above image the robotic tank is loaded with water tanker and a pump which is controlled over wireless communication to throw water. At the transmitting end, push buttons are utilized to send control signals to the receiver to control the movement of the fire fighting robot. 2 motors are used in this project to move the robot forward and backward and third one is for movement of robotic arm. Motor driver IC is used to drive the motor after receiving command from microcontroller. 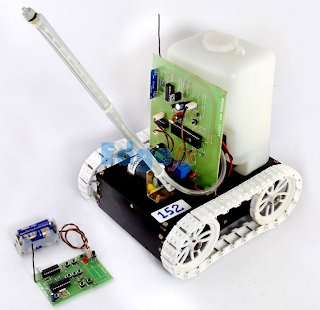 In this project RF transmitter works as a remote control and person operating this robot can send command easily. The microcontroller is programmed using keil compiler and used embedded C for programming. This project cost about 17k for project kit and if you want to learn yourself then you can buy DIY kit for you. This project comes with full project report, source code, circuit diagram, block diagram, documentation, PPT etc.